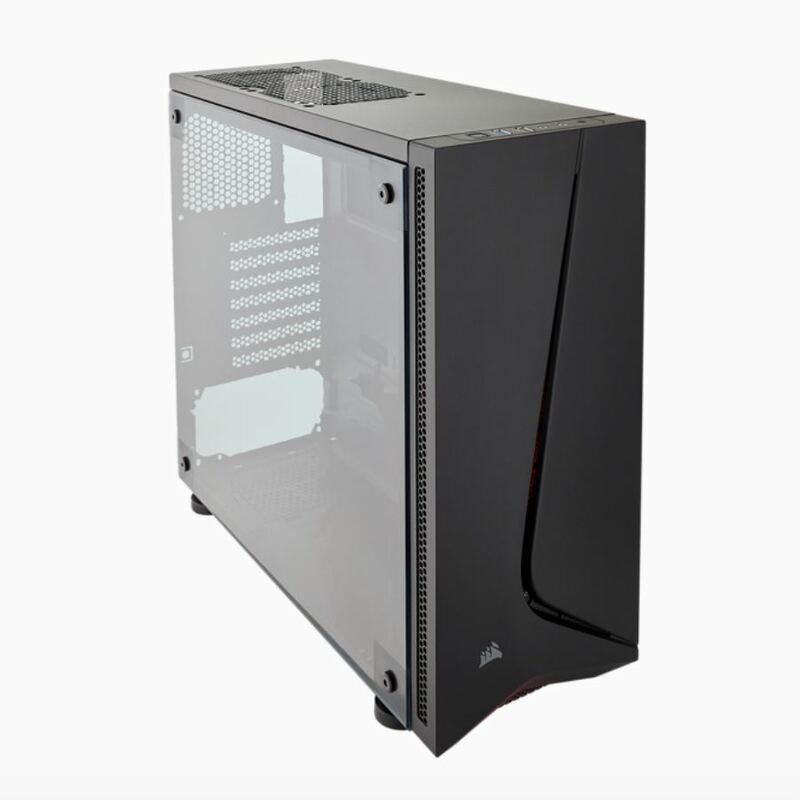 Corsair announced the release of a new case in the Carbide series, which they've named the SPEC-05 Mid-Tower Gaming Case. The $50 chassis adds to Corsair's SPEC value segment with a new exterior design as well as continued flexibility on the interior. The case supports Mini-ITX, MicroATX, and ATX sized boards, has room for up to a 240mm radiator as well as multiple hard drives and SSDs. The exterior uses an edge to edge windowed side panel and smooth flowing design on the front with an asymmetrical line down the front giving way to an attractive and inexpensive chassis. The edge to edge window design on the tinted side panel will give users an unobstructed view of the interior. The side panel is held on by flat screws requiring a tool to remove. The front panel of the case has a smooth look with a line slicing through the front. Behind it, the included 120mm red RGB fan peeks through the perforated mesh which makes the line. 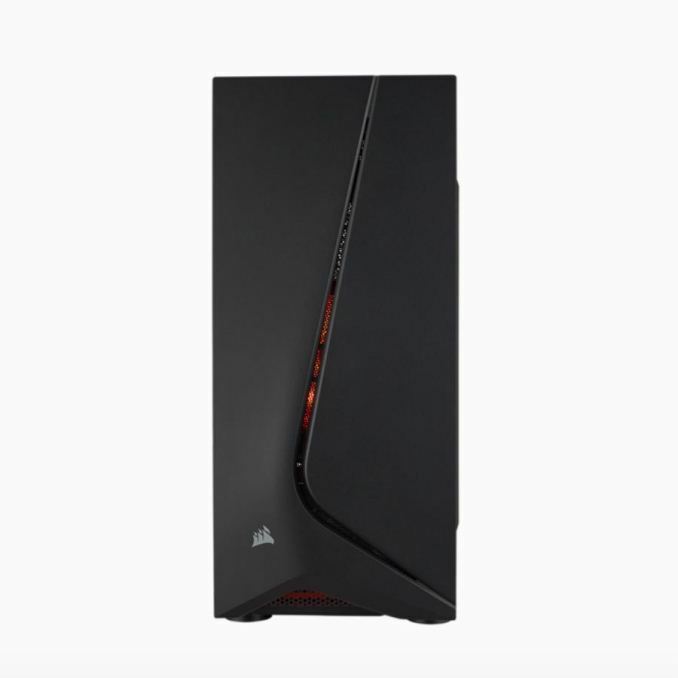 Additional intakes are found on both side of the front panel and include a removable dust filter with another keeping dust out of the PSU on the bottom. Though there is minimal filtering through the mesh on the front, a dust filter is found on the bottom of the case for the power supply. 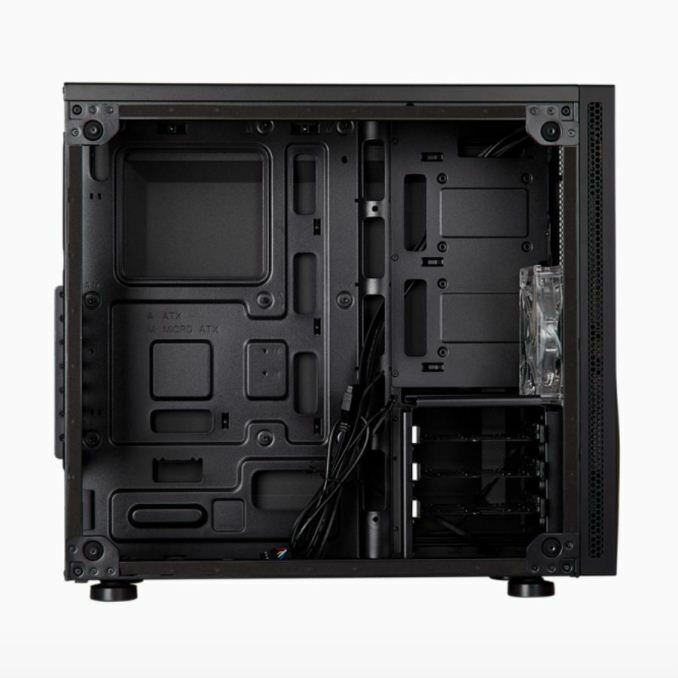 On the top of the case, Corsair has two USB ports, one USB 3.0, one 2.0, along with headphone and microphone jacks, as well as power and reset buttons. Inside the case, Corsair talks about wire management using multiple tie-down points and cable routing holes to neatly tuck the cables away for any size board. The right side panel also sticks out to allow for more cables to fit without the bowing we sometimes see out of a flat panel. There is a hard drive tray at the bottom front capable of holding three 3.5-inch and two 2.5" drives. Fan support is plentiful with up to six fans (3 Front, 2 Top, 1 Rear - one) when the hard drive cage removed (five otherwise). 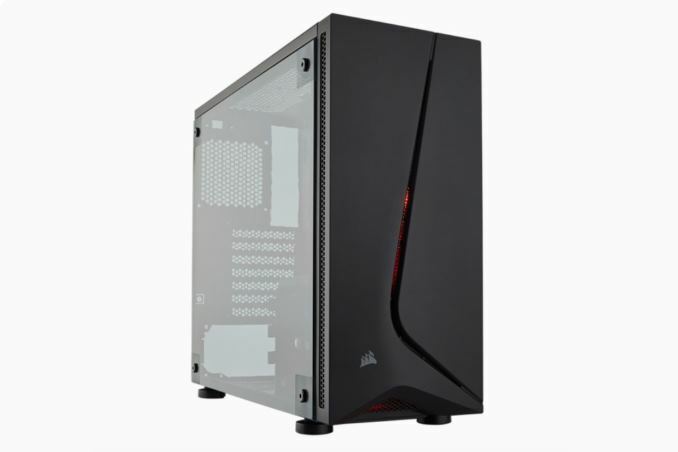 Corsair states radiator compatibility is 120mm, 140mm, or 240mm with placement in the rear (120mm) or the front (up to 240mm). 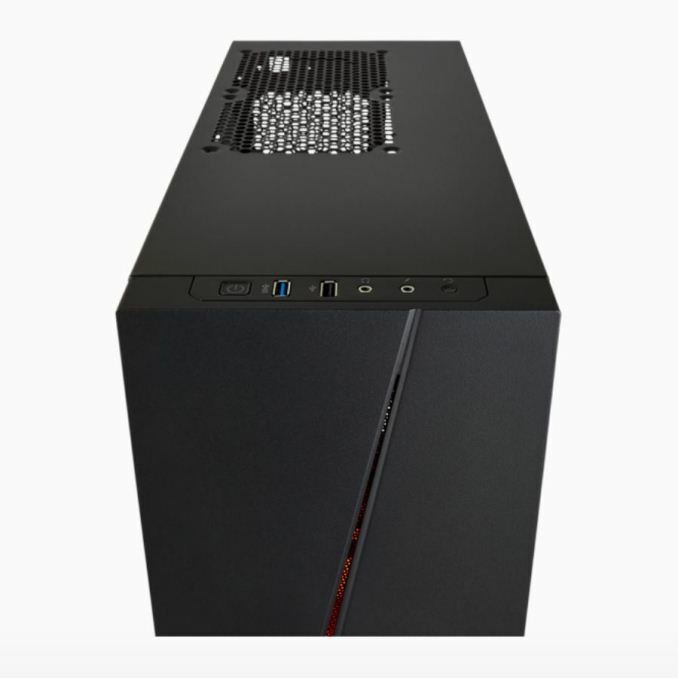 The SPEC-05 is able to support video cards up to 14.5" long and CPU heatsinks up to 150mm tall. Users are not going to find multiple included RGB fans, fan controllers, or USB3.1 ports at this price point, but for $50 the SPEC-05 checks off enough boxes for a good entry in the value segment. It is not so much about volume. It is how much table space a modern ATX case steals. And it is because of ATX standard (on MB etc). ITX has the same problem plus only 2 dimms. 2) standard location of CPU for direct outlet for CPU cooler. 3) 4 dimm/SODIMM slots around the CPU in the square for the shortest possible paths (and thus latency and reliable signal frequency). 4) Just 20V external power supply, for simple power supply, compatible with USB PD for low-power applications. 12, 3.3 etc will have to be on the MB. 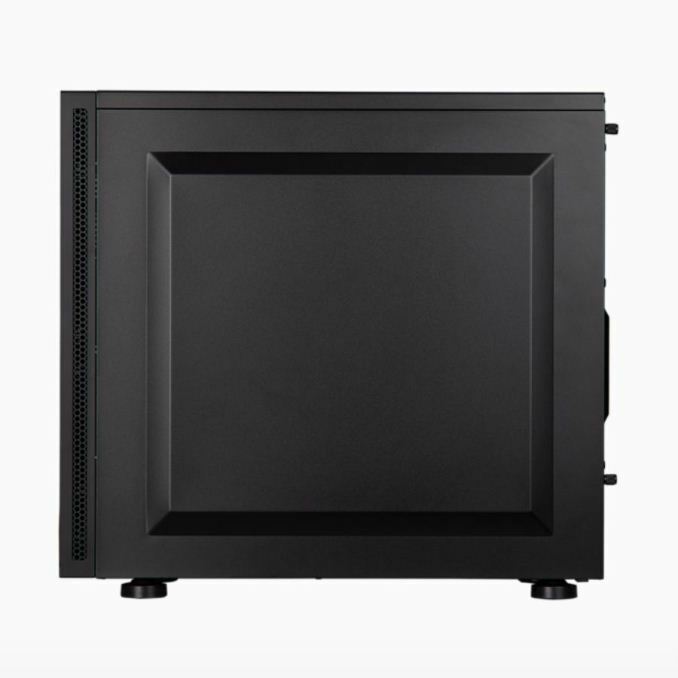 5) 3-part PC assembly - base with optional power supply and storage bays, MB with the external border, standard top. I say superior as far as what is "in the box" such as Fractal Design Define C which has some of the best filtering included in the package as well as 2 pretty decent 120mm fans, it may not be "as roomy" as others, but comes at a very close price point. I cannot use such a case for my NAS because it does not have enough 3.5" HDD bays. It does not make sense to use it for my desktop because it is too big for the mATX board with m2 SSD and a single expansion card, the video card.